Beach tour of Kerala is about walking through the enticing stretch where sun, sea and sand form a perfect setting to relax on these beach retreats. The tour, in its beginning gives tourists a chance to acclimatize themselves with the lazy spree at Kovalam near Trivandrum. An internationally famed beach resort, Kovalam is stringed with three beautiful beaches namely Lighthouse, Hippie’s haven Havah, and Samudra beach parted by rocky outcroppings. Towards the middle of the journey, the tour enters the southernmost tip of Indian mainland bestowed with a surprising beach and majestic landmarks associated with three Indian luminaries. 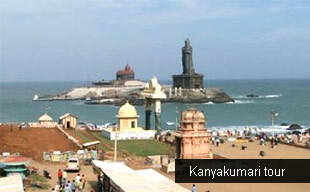 Welcome to Kanyakumari, a beach with a difference. First step on this beach intrigues visitors about the majestically tall monuments on an island surrounded by the confluence of three seas. Vivekananda Rock Memorial, Gandhi Memorial and Saint Poet Thiruvalluvar’s statue hold attractions besides a bewitching Kanyakumari beach visit. 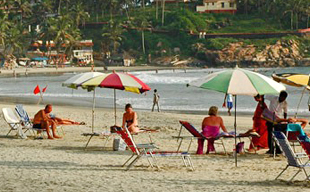 The next beach en route will offer visitors the luxury of solitude in Varkala. Beach Tour of Kerala is all this and much more that can be experienced only. On arrival at Trivandrum Airport, meet Incredible India tour representative who will assist your transfer to Kovalam, a beach retreat just 16 km away from the city center. Check in to the hotel. 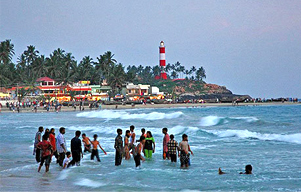 Later spend the day at beautiful beaches of Kovalam. Overnight stay in a resort. Post breakfast, the day is entirely on your leisure. Tourists can choose to laze on the beach, admire the sprawling beauty of beach, play with the golden sands or swim in the shallow water. Options for enjoying water adventure sports like parasailing, surfing, catamaran ride, skiing, swimming and kayaking, etc are also available at extra cost. A special spa therapy session individually designed for specific needs can also be availed in the balmy surroundings of Kovalam. Overnight stay in a resort. After breakfast, a drive past 80 km south west takes tourists to the beach bestowed with many unique features called Kanyakumari. Located on the confluence of Arabian Sea, Indian Ocean and Bay of Bengal, this southernmost beach of Indian mainland is one of the most popular beaches in India. Ingrained with rich natural, cultural, spiritual and inspirational heritage, a tour to Kanyakumari is one of the best beach experiences in India. On arrival in Kanyakumari, check in to the hotel. Visit Kanyakumari offshore monuments like Vivekanand Memorial, Thiruvalluvar Statue via ferry and Temples and Museum through inland journey. Explore the local markets in the free time and experience the scenic hues on the panorama of Kanyakumari beach. Overnight stay. After breakfast in Kanyakumari, drive past 110 km again brings back a visitor to Varkala, one of the virgin beaches of Kerala. This beach paradise of Varkala is a less crowded beach bestowed with charming natural beauty. Check in to the hotel on arrival. Later spend the day at beautiful Varkala beach, famous as Papanasini beach. A dip in this beach is considered very sacred. Overnight stay in Varkala. This day in Varkala is free at leisure. Enjoy the scenic beauty of the beach alongside the rocky cliff. Overnight stay at the hotel. After breakfast, transfer to Trivandrum Airport to board scheduled flights back home or onward destination.